The fact that Canada is admitting as refugees at least 250 White Helmets and their family members exposes the involvement of the Trudeau government, like the Harper government before it, in the illegal, US-led, regime-change operation in Syria. These two federal governments are collectively responsible for setting up and continuing the international coalition that produced the proxy war against Syria, using terrorist mercenaries as its footsoldiers; leading the international regime of brutal economic sanctions against Syria which turned about four million Syrians into refugees – (the international sanctions regime was drawn up in a meeting in Ottawa in June 2013); demonizing the legitimate government of Syria, breaking off diplomatic relations with it, and trying to delegitimize it in international forums; supporting armed rebels against Syria, a member state of the United Nations, by bringing their leaders to Ottawa and giving them funds; overflying Syria on military missions without the express consent of its government; and supporting the propaganda arm of the regime change operation through the White Helmets. Now that the Syrian government has liberated Daraa, where the western-sponsored regime-change operation began in 2011, the “rebels” and their auxiliaries have had to scramble to find places of refuge. Thus, the Trudeau government has felt obliged to admit as refugees to Canada some of their foreign policy assets, namely the White Helmets. Who are the White Helmets? The White Helmets claim to be a “fiercely independent” organization of volunteer first responders in Syria helping Syrian civilians injured in the war. In fact, the White Helmets are a fiercely partisan organization of relatively well-paid employees, set up by British and US intelligence services inside of Turkey (a belligerent in the war against Syria) in 2013. 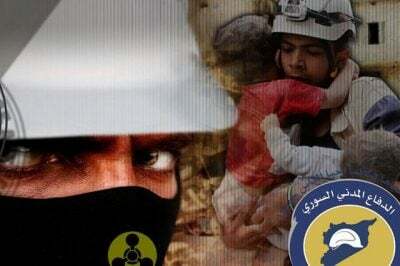 A Madison Avenue public relations firm was contracted to develop the concept of the White Helmets as a humanitarian agency for public consumption in the West – to provide a ‘suger-coating’ to an ugly and illegal imperial war. John Lemesurier, a former British military intelligence officer and later “military contractor”, was hired to front the organization, which has been funded to the tune of about 150 million dollars by the governments of the USA, UK, France, Holland, Denmark, Japan, New Zealand, and Canada, among others. In 2016, Canada donated $4.5 million dollars to the White Helmets. Currently, a Freedom of Information request is seeking to determine if the Canadian government has made repeated donations of $4.5 million in 2017 and 2018. On top of the donations, the Canadian government has organized two cross-Canada publicity tours of White Helmet personnel in recent years in various cities. This past March, a delegation of White Helmets was welcomed to speak to the Canadian parliament’s Human Rights Committee. In addition, the New Democratic Party endorsed the White Helmets for the Nobel Peace Prize, which it failed to win. The White Helmets are embedded in the Al-Qaeda terrorist network and operate exclusively in terrorist-held areas of Syria. Though it also calls itself the Syrian Civil Defence, the government of Syria created the real Syrian Civil Defence in 1953 and was a founding member of the International Civil Defence Organization. Once in place inside the terrorist-occupied enclaves inside of Syria, the true role of the White Helmets emerged. The group specialized in making videos of dramatically-staged rescues of children from among the rubble of part of cities which Al-Qaeda (and sometimes other terrorist groups) had managed to seize and occupy. Two notorious staged videos stand out: the staged rescues of Omran Daqneesh in Aleppo and Hassan Diab in Douma. Occasionally, however, the White Helmets joined in recreational video competitions, such as the Mannequin Challenge. The twofold principal purposes of the child-rescue videos was, first, to demonize the Syrian government as a brutal tyranny, even though it was lawfully defending its sovereign territory against foreign invasion, and, secondly, to promote the western regime change operation in Syria as a humanitarian intervention. Specifically, the White Helmet videos were timed to promote calls by western governments for directly military intervention in Syria by such means as a no-fly zone (similar to the one imposed on Libya in 2011) or a “civilian corridor”. And, on at least two occasions, the tactic worked. In April 2017, the White Helmets staged a false flag chemical attack on Khan Sheikhoun which prompted a US missile attack on the Sharyat Air Base in Syria. A recent outstanding example of the propaganda use of such videos was the staging of a fake nerve agent attack in Douma, Syria, on April 7 of this year. The incident, later revealed as a hoax by the Organization for the Prohibition of Chemical Weapons (OPCW), nonetheless resulted in over one hundred missile strikes by the USA, UK, and France on Syria on April 13, 2018. In addition, the White Helmets’ true role as an auxiliary to terrorism was captured on film on several occasions when they participated in Al-Qaeda summary executions and by Facebook postings by numerous White Helmets on their personal accounts showing themselves moonlighting as armed Al-Qaeda fighters and heaping praise on Al-Qaeda leaders. Contrarily, civilians inside the enclaves in Syrian cities liberated from Al-Qaeda and ISIS told many western reporters that the White Helmets provided no medical help or assistance to them, but rather only to the armed terrorists. Moreover, real Syrian Civil Defence workers testified that many of their comrades were killed by Al-Qaeda fighters and their equipment and vehicles given to the White Helmets. The rescue of the White Helmet “rescuers” by Israel through the Golan Heights should not come as a surprize because Israel has been a major player in the illegal, failed, regime change operation in Syria. Israel has bombed Syria more than one hundred times during the war. Israel openly supported FSA fighters with arms, intelligence, and funding in southern Syria and routinely transferred wounded terrorists to hospitals inside Israel for medical treatment before returning them to the front. Israeli PM Netanyahu posed for photos in one of those hospitals at the bedside of wounded terrorists last year. Today (July 22, 2018), in a tweet, Netanyahu stated that both President Trump and Prime Minister Trudeau personally asked for his help in rescuing the White Helmets from Syria. Syria is well rid of these White Helmets. But, if Canadians understood who these people really were, they would strongly object to the settling of terrorists in our midst. Last November in the House of Commons, Trudeau asserted that Canadians returning from terrorist activities in Syria and Iraq would not be charged with criminal offences. Rather, he asserted, “We also have methods of de-emphasizing or de-programming people who want to harm our society, and those are some things we have to move forward on.” At the end of the day, then, the Trudeau government in effect embraces terrorist fighters and their auxiliaries. That the Canadian government is planning to admit White Helmets personnel to Canada as refugees should gravely concern Canadians. These civil defence poseurs are ideologically committed to terrorism, personally connected to Al Qaeda, and have the blood on their hands of many Syrians whose country they helped to invade and occupy. The potential for them to cause harm in Canada is high. participate in the reconstruction of Syria through payments of reparation.